World Environment Day 2017, organised by Universal Peace Federation UK, featured speakers on different topics from renewable energy and GM foods to 'connecting with nature'. There some interesting questions and comments from the audience some of whom were also very knowledgeable. The theme of the meeting 'connecting with nature' was raised by speakers and the audience who shared their own profound experiences. The Universal Peace Federation applauds the United Nations, and all who gather for the UN Conference on Sustainable Development (Rio+20), to address some of the most critical problems facing humanity today, especially problems linked to unsustainable economic models. On the occasion of “Rio+20”, which takes place from 20 to 22 June 2012 in Rio de Janeiro, Brazil, UPF offers the following statement. A programme to consider values that would allow sustainable development of humankind was held at 43 Lancaster Gate in UPF - UK's Headquarters. It was an opportunity to present some of the ideas and initiatives of the Universal Peace Federation stemming from its Founder, Father Sun Myung Moon, while contemplating the beauty of nature and its inter-connectedness with humanity through the astounding video 'Home' by Yann Arthus-Bertrand and discussing these issues at length afterwards. 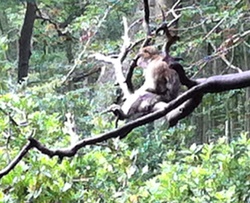 Photo from Monkey Forest in Staffordshire UK; a reserve for the Barbary Macaques monkey that is on the endangered species list. Jack Corley - What Values Should Define Sustainable Growth? Dr Yong Cheon Song - What Values Should Define Sustainable Growth? What Values Should Define Sustainable Growth?